This is a recipe I created for an I Can’t Believe it’s Not Butter promotion. I honestly wasn’t sure how I Can’t Believe it’s Not Butter would work in choux pastry, but I’m glad I experimented because it worked beautifully. 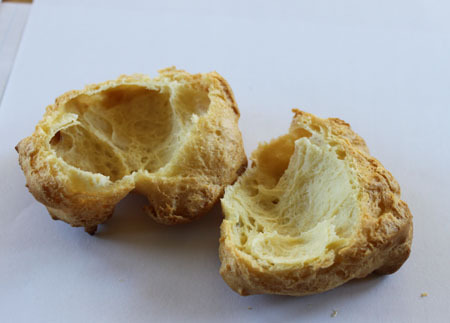 This choux pastry, which is the type of pastry used for profiteroles, has a super buttery flavor and a nice structure. 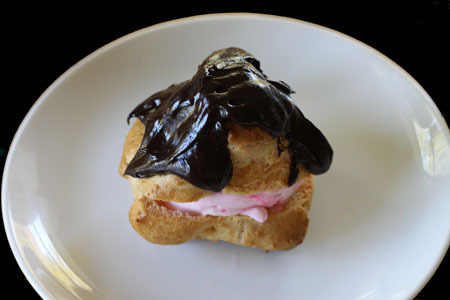 I used the choux to make profiteroles, but you can pipe it out in whatever shape you like. I’ll update this when I use it for eclairs. Mix together the flour and salt; set aside. In a 3 quart saucepan, heat the I Can’t Believe It’s Not Butter and water just to a boil. Add the flour mixture and stir over medium heat for about 1-2 minutes or until mixture forms a ball in pan. After mixture forms a ball, continue mixing it for another minute, pushing it around in the pan. Remove from heat and let cool for 10-15 minutes, stirring occasionally. Add eggs one at a time, beating well with the mixing spoon after each egg is added. Using a heaping tablespoon, drop 6 equal size portions of dough onto a parchment lined or lightly greased cookie sheet spacing about 3 inches apart. Bake on center rack for about 22 minutes or until puffs are golden. Remove from oven. Turn off oven and let it cool down for about 5 minutes. Meanwhile, using a toothpick, poke a small hole in the bottom of each pastry puff. Return puffs to cookie sheet and place puffs in closed “off” oven for 10 minutes to dry. Remove from oven and let cool completely before filling. Sauce: Put the chopped chocolate in a bowl. In a small saucepan, heat the cream and I Can’t Believe It’s Not Butter until it just begins to simmer. Pour over chocolate and stir until smooth. Stir in the vanilla. Assemble profiteroles. Split each profiterole horizontally down the center and fill with a scoop of ice cream. Drizzle warm or slightly cooled ganache over top. If you’re intimidated by pastry, there’s nothing that will get your confidence up like a batch of choux. It’s simple! For this batch, I made the choux with I Can’t Believe It’s Not Butter and got some of the best results ever. Like hot lava cakes, profiteroles are impressive and perfect for making ahead. You can bake the puffs before dinner and have them cooled and ready to go for dessert, or you can make them a week ahead, freeze them, then crisp them for 5 minutes in a 375 oven when ready to use. You can also make the ganache ahead of time. Just chill it until ready to use, the put it in a stainless steel bowl and set the bowl over but not touching barely simmering water until the ganache softens.